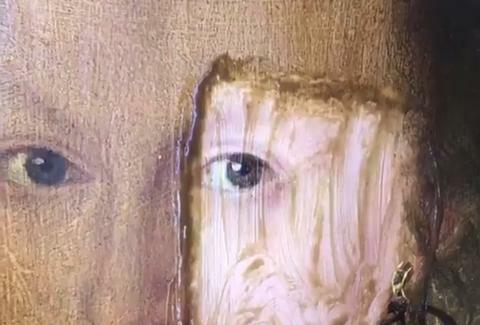 What does it look like to dissolve hundreds of years of gunk off an oil painting? A video posted Monday by Fake or Fortune? host, art dealer, and art historian Philip Mould has dropped jaws. The video shows an oil painting having preservation work done. In a matter of seconds, 200 years of yellowing varnish is washed away to reveal the crisp, beautiful work underneath. Varnish is applied to help preserve and protect paintings, but over time it will start to yellow. In this case, it seems to have even gone a little brown. There are a variety of practices, but working off and reapplying a varnish isn't uncommon. When you see the subject's earring appear from under the varnish, it's instantly clear why this is being done. Mould has not shared the secrets of what method is being used. Turpentine is sometimes used with another solvent, but that doesn't appear to be what's happening here, as pointed out by Bryan Menegus at Sploid. No matter what method is employed, it takes a good deal of skill and time to remove the varnish and not have any impact on the actual painting underneath. Restoration is generally not a fast or simple process by any stretch. Details about the featured painting aren't abundant. Mould later clarified that the "lady in red" is 36 years-old and was painted in 1618, according to an inscription. It's massively impressive. Never forget that art restorations can go terribly, terribly wrong.